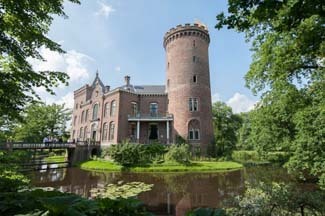 Kasteel Sterkenburg is one of the oldest castles in the area, with its first mention in 1261 as the “castrum Long Bruch” or castle in Langbroek by the bishop of Utrecht. The likely builder of the castle was knight Gijsbrecht Wulven, completed by his son knight Severity Wulven. Within a few hundred years, this family died out. Sometimes it seems that the aristocracy have their share of vicissitudes of life. At Sterkenburg in 1647, Anthonis Aeswijn was found dead in the forest shortly after his marriage to Margaret Torck. The murder was never solved. A child was born posthumously; some came prematurely. Fortunes rose and plummeted. Finally, a Mr. Karel Jan Frederik Cornelius Kneppelhout (1818-1885) acquired the property and renovated it to its present appearance. His family originally just used it as a country home, but moved here permanently in 1870. The Kneppelhout family retained ownership until 1978, but by that time the castle was fairly run down. A Mr. Henry de Groot bought the estate, who in turn sold it to the current owner in 2004. The Foundation for the Conservation of Sterkenburg now oversees the management of the property and the extensive restoration work of the castle, parks, and gardens. Grants from the RACM, or Rijksdienst voor Archeologie, Cultuurlandschap en Monumenten help to reach this goal. Kasteel Sterkenburg is not a hotel in the conventional sense. It operates as a bed and breakfast, along with hosting special events and weddings. You won’t find the usual hotel services here. 13 rooms located in the castle, coach house, or gardener’s house. Double rooms: 145–175 euros (outbuildings) or 195–245 euros inside the castle. Driebergen is about half an hour east southeast of Utrecht. Surrounded by nature in a beautiful location, this castle is open to guests on a bed-and-breakfast basis. Or if you have a special event in mind, you can reserve the entire estate. Interiors are gorgeous—especially the Great Hall, lounges, and stately dining room with its balcony. There is even a neo-Gothic chapel on site. Guest rooms can be found in the outbuildings—comprised of the 17th-century coach house and gardener’s house—or inside the castle. The outbuilding rooms are light and airy, with a country house decor and wood floors. Two of the rooms in the gardener’s house have a private terrace with views of the castle. Bathrooms are modern. The round tower rooms inside the castle are really special. Thick walls are of brick with alcoves set under archways and occasional antique pieces. You reach these rooms via an old spiral staircase. Views of the surrounding green countryside and the castle moat from the tower are fantastic. Guest rooms do not have TVs, which, depending on your point of view, add to the property’s serenity. Since there is no restaurant on the premises, you can easily dine in nearby Driebergen. A delicious breakfast is served in the Gardener’s house, a sunny terrace, or in your own room.